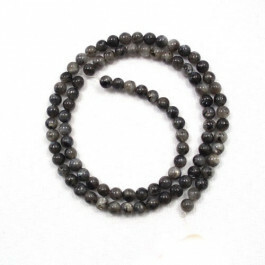 A-Grade Larvikite Stone Round 4mm (100pce Strand) - 40 cm /16'" Strand. Coarse grained, feldspar rich. exhibiting bright blue “flashes” in some areas (sometimes referred to as “labradorescence). Gets its name from its locality - the Larvik Fjord region. Often used as a facing stone, one famous example is its use in the United Nations building in New York City. More famously though it is the stone of the modernistic bust in Larvik of Thor Heyerdahl (Kon Tiki fame) and a native of Larvik. Has many trade names including Black Moonstone, Blue Norwegian Moonstone, Larvik Labradorite. Said to carry a mysterious, magical energy which stimulates inner visions and enhances psychic abilities. Allows one to see the past, including past lives.